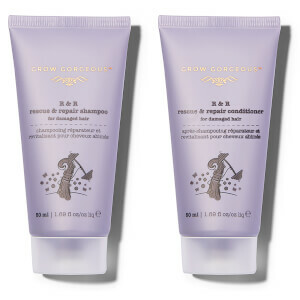 Use in conjuction with the Rescue & Repair Shampoo for maximum efficacy, and expect intensely nourished and conditioned strands with resilience to breakage and a smooth, hydrated look. After using our Rescue & Repair Shampoo squeeze out excess water and apply a generous amount of Grow Gorgeous Rescue & Repair Conditioner. Work through the lengths and ends of your hair and leave for 2-3 minutes. Rinse thoroughly and style as usual. Aqua/Water/Eau, Cetearyl Alcohol, Parfum (Fragrance), Glycol Distearate, Ethoxydiglycol, Glycerin, Behentrimonium Chloride, Hydroxyethylcellulose, Phenoxyethanol, Panthenol (Provitamin B5), Salvia Hispanica (Chia) Seed Oil, Quaternium-91, Silicone Quaternium-18, Butylene Glycol, Hydrolyzed Ceratonia Siliqua (Carob) Seed Extract, Cetrimonium Methosulfate, Mica, Astrocaryum Murumuru (Murumuru) Seed Butter, Theobroma Grandiflorum (Cupuassu) Seed Butter, Trideceth-6, Zea Mays (Corn) Starch, Chlorphenesin, Phytantriol, Trideceth-12, Caprylic/Capric Triglyceride, Trisodium Ethylenediamine Disuccinate, Sodium PCA, Sodium Lactate, Arginine, Bambusa Vulgaris (Bamboo) Leaf/Stem Extract, Niacinamide (Vitamin B3), Aspartic Acid, Sodium Starch Octenylsuccinate, PCA, Potassium Sorbate, Calcium Pantothenate, Maltodextrin, Sodium Benzoate, Citric Acid, Sodium Ascorbyl Phosphate, Glycine, Alanine, Beta Vulgaris (Beet) Root Extract, Serine, Sodium Hydroxide, Valine, Guar Hydroxypropyltrimonium Chloride, Pyridoxine HCL, Tocopheryl Acetate (Vitamin E), Polyquaternium-7, Isoleucine, Proline, Threonine, Sorbic Acid, Histidine, Phenylalanine, Silica, Helianthus Annuus (Sunflower) Seed Oil, Tocopherol (Vitamin E), Butylphenyl Methylpropional, Limonene, Linalool, CI 77891 (Titanium Dioxide). I am constantly using a curling iron on my hair so the ends damage pretty quickly. I've used this conditioner a few times and already I am noticing that the ends are a lot healthier! My hair feels silkier the more I use it and I can't get over how great my hair smells now! I'm a fan! My husband got this conditioner for me. I tried the shampoo and loved it, so figured I would give the conditioner a try.. I straighten my hair frequently, because of this I get split ends and my hair can look a bit frizzy. Since using the conditioner my hair feels much smoother and I have received several compliments about my hair. Will buy again! I've only used this conditioner a few times, but I have noticed a difference in my hair. It's not the improvement I was hoping for, but based on the results from a few uses, but I believe it will help get my hair back to health if I use it consistently. I love how this collection smells! I feel like I've just been to the salon after using it because of its luxe smell. This conditioner is unlike any I've ever used before. It's not as thick as conditioners I've used in the past, which threw me off and I think I used more than I probably needed. But, felt great in my hair and my hair felt really smooth and nice after using. I have tried so many products on my dry damaged hair with little to no change until I tried this gem of a product! 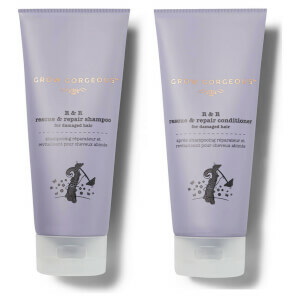 Grow Gorgeous Repair Shampoo and Condition made a huge difference in just one application. I was so stoked, my dry hair didn't even feel like my hair! It was so soft and silky which is a miracle! My sister who does hair for a living actually asked what I did to my hair because it looked so good! Are you kidding me? That alone is a game changer! Love, Love, Love! I have long , thick, naturally wavy hair, and live in a dry climate. I noticed a difference in the shine and softness of my hair after 2 times!! I also, love the smell and had many comments that my hair smelled good. I will definitely continue to use this product!